Blood Code: On the options screen, highlight EXIT and press A+B+C+D simultaneously. 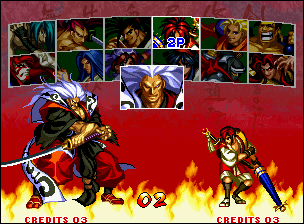 Play Zankuro: In VS mode, highlight Shizumaru on selection screen and enter LEFT x3, DOWN, RIGHT, RIGHT, UP, RIGHT, DOWN, RIGHT, RIGHT, UP, LEFT, LEFT. When the timer reaches 3, press A+B+START.